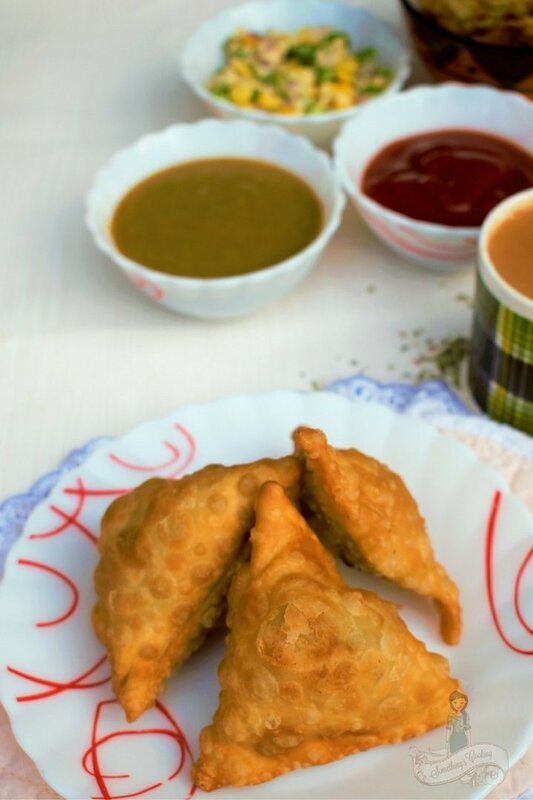 Samosa is a crispy fried Indian snack filled with spiced potato and peas mixture. Usually served as a teatime snack, it is popular not only in India but across other South Asian countries and the Middle East. 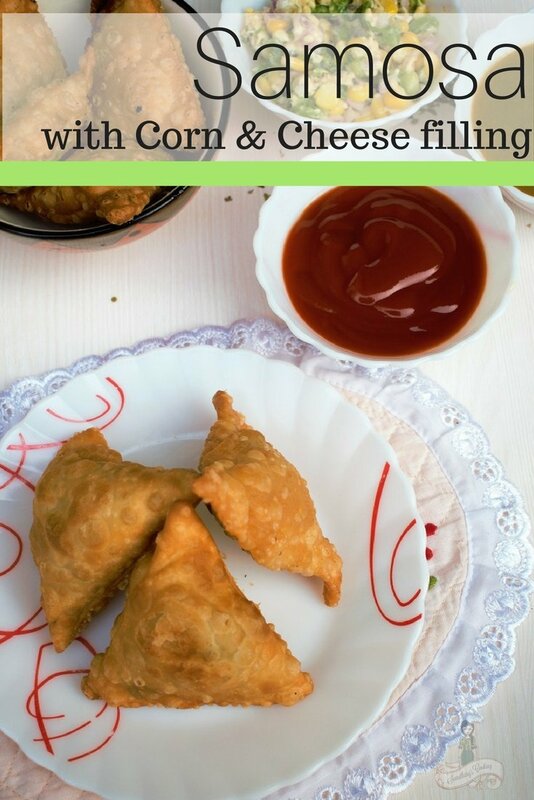 Samosas can be made with any filling, be it keema or minced meat or a corn cheese filling like I did. This will be a favorite with kids, for sure! Samosa makes their appearance everywhere- be it the street vendors, teatime snack, party snack, appetizer, restaurants or cafes. It is available across India for it is a popular street food. And what’s the killer combination? Samosa and Masala Chai! Making a Samosa is a frightening experience for many. 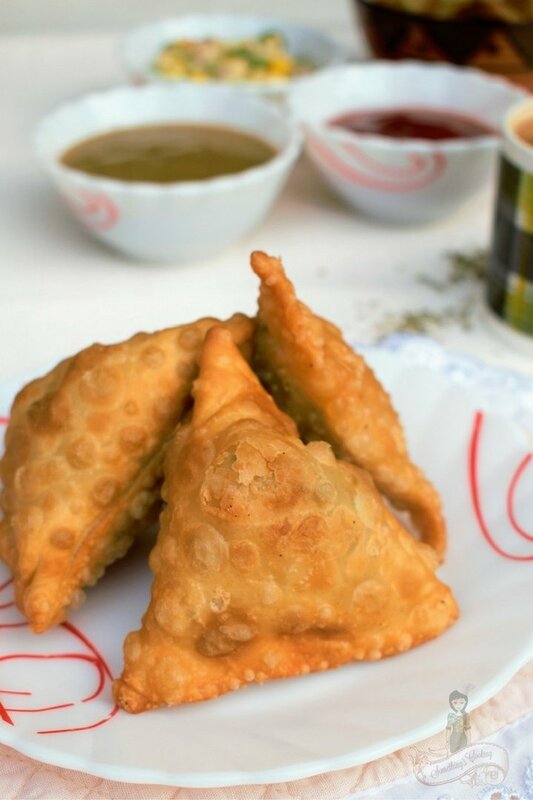 You need to make sure that the dough you make is of the right consistency, that the stuffing is of the right amount, it should be tightly sealed and the oil should be moderately hot for the samosa to be cooked inside-out. Mix together the flour and salt in a bowl. Knead to form a firm dough adding water little at a time. Cover it with a wet muslin cloth. Let it rest for at least 20 minutes. Mix together the boiled corn, cheese, capsicum, salt and mixed herbs. Set aside. Knead the dough again and divide them into six equal parts. Take each ball and smoothen in your palm. Roll the ball into a perfect circle with the help of a rolling pin. Divide into two using a knife or a pastry cutter. Apply little water on the straight edge of the semi circle. Make a cone shape and seal the edge well. Fill the cone with a tablespoon or more of the filling. Apply water on the edge and close. Seal it tight. Heat oil in a pan and when moderately hot, place the samosa. Let it cook on both sides for at least ten minutes. Do not cook in high flame, for it will result in crisp outer layer and uncooked inside. 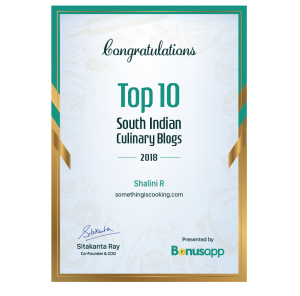 Serve with mint chutney or tomato ketchup. The making of dough is adapted from Chef Harpal Singh’ recipe. The ratio of Ghee/oil to flour should be always 1:4. So, if you take 1 kg of dough, use about 200gms of ghee. If you use too little fat, it leads to tiny air bubbles on the samosa. If you use more, it will break the crust. You can also make samosas with wheat flour but the results wouldn’t be extraordinary. It makes hard samosas. You can also use half all purpose flour and half wheat flour. I haven’t added chillies or red chilli powder to the filling. Wanted to make it less spicy so that the kids can relish them. You can also add little black pepper powder as well. For variations, you can also add half a teaspoon of carom seeds or Ajwain while preparing the dough. Not a fan of cheese, I’ll try the corn with potato next instead of peas. Wow! This recipe is really a delight. Me gonna surely try this one and your photos are really intriguing. Saved this Shalini, I have always wanted a recipe for Samosa’s your pastry looks wonderful and I love the filling. Yum..although I don’t eat samosas ..this one is different. My girls love corn cheese sandwiches…I am sure they will like this onetoo.